Our destination of the night is the Inn & Spa Cedar Falls. We are truly famished from another exciting outdoor activity loaded day so we can not wait to see what super star Chef Anthony Schulz has on the menu. The Inn & Spa At Cedar Falls is a premiere destination for many traveling to the Hocking Hills Area. In fact the Inn & Spa at Cedar Falls resides in the heart of nature and bordering 3 sides of Hocking Hills State Park. Known for it’s luxury dining experiences with fine American Cuisine, we can’t wait for the presentation. The setting of the dining area boasts a beautiful patio area as well as a lovely large dining room with plenty of seating and wonderful Decor. 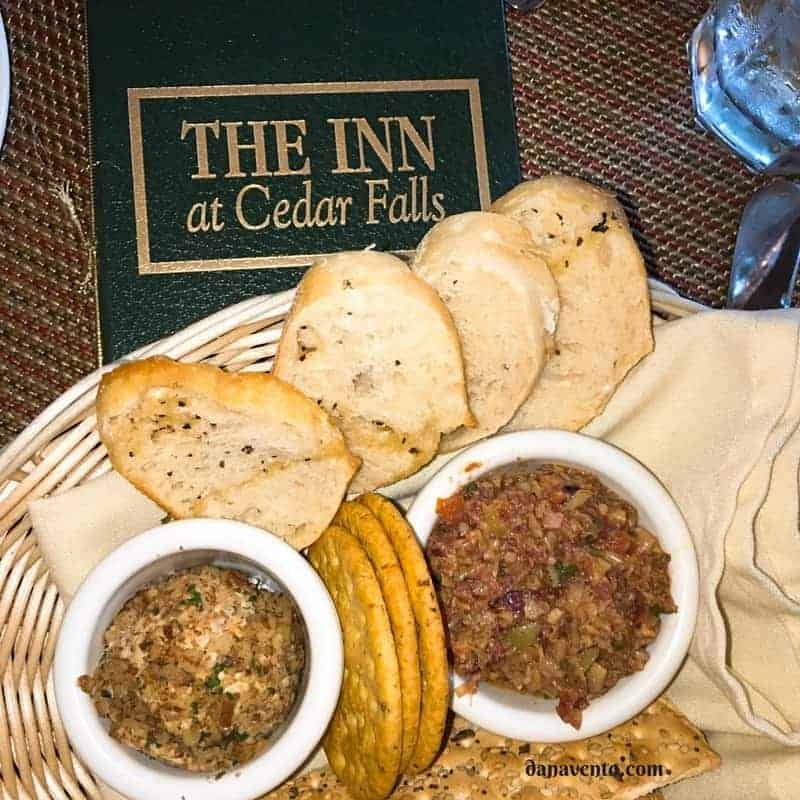 Perhaps the best news is that if you have food allergies you can certainly dine here as the Inn & Spa at Cedar Falls Dining is very accommodating to those with food allergies. In addition to having a lovely hosted meal this evening, we were treated to a lovely self-guided tour of the property so we could become more acquainted with this quaint and picturesque setting. Lavishly live life out loud and travel to a place where natural beauty is complemented by unique dining experiences and lovely lodging options. When is the best time to visit the Hocking Hills area? I say it is always. Whether you love hiking, or just packing on into a log-cabin, there’s something to do year round. In the spring, the area is great for hiking and breaking your legs back into the routine of exercise. While the fall offers a great opportunity to enjoy natures great foliage. Truly an experience for both families and couples, the Hocking Hills area is exceptional for adventure, cuisine and lovely lodging! 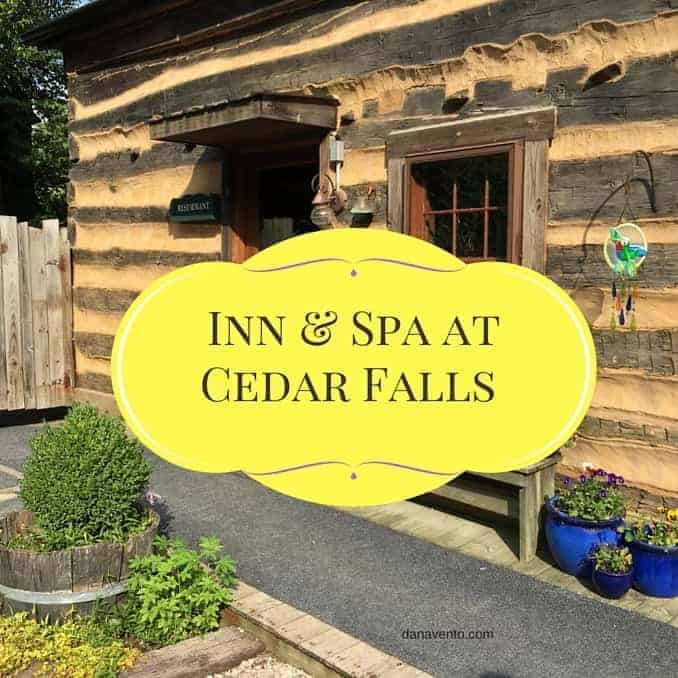 Honestly to capture the beauty of the Inn & Spa at Cedar Falls, the proper images have to come from your natural eyesight and not photos because they simply won’t paint a clear picture of the scenery. You can take a look at the Larkspur Cottage, as well as the surrounding woodlands in these Images. We also visited a few of the rooms at the Inn: Hummingbird and the Cardinal. Each room type caters to a different size family, but all have equally wonderful amenities. 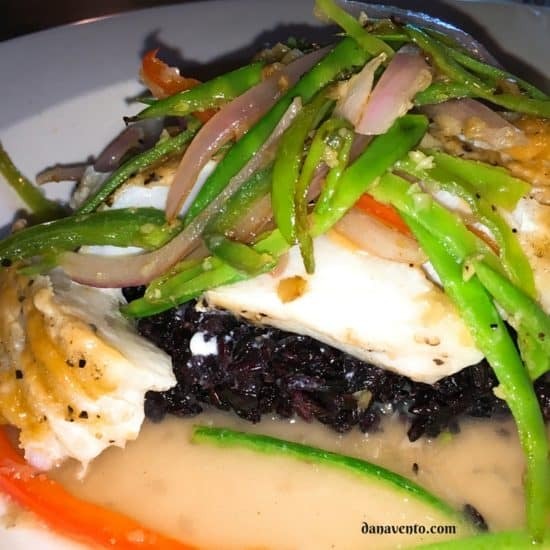 Our true experience at the Inn & Spa at Cedar Falls was a dining occasion where my youngest son who is plagued with severe and life-threatening food allergies could dine. For my other son and myself, we were about to experience 5-star dining in a very lovely Inn. I can assure you as long as you have a meal at the Inn & Spa at Cedar Falls you are receiving the full area experience. You’ll never have to worry about that question whenever you’re staying at the Inn and Spa at Cedar Falls because she will find unique dining experiences. 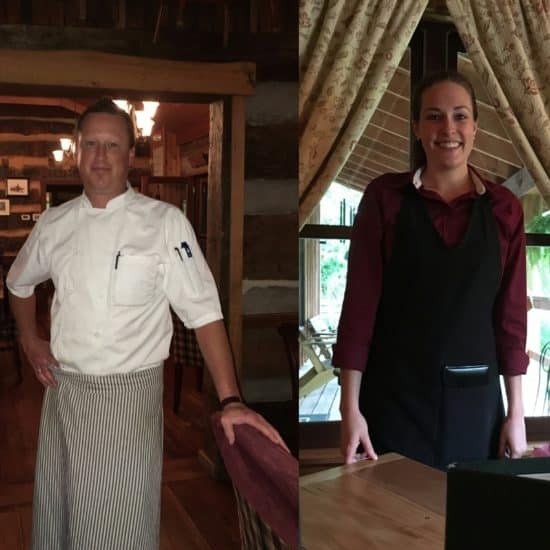 All of the food is prepared from scratch, and the head chef has an incredible staff to assist his culinary ability. We had the good fortune to meet Executive Chef Anthony Schultz and I was excited to learn he has 4 boys of his own and …. one has peanut allergies so he is well-versed in fighting this little food allergen! On the right is our wonderful server Emma! This basket was the perfect start to an incredible meal. My oldest decided that he wanted to try the cheese ball and I was not sure what was going to come out. If you are accustomed to cheese balls you know they’re pretty large and I was totally hoping this was not going to be the case. We were presented with a lovely basket with both and ice cream dollop-sized cheese ball and one of olive tapenade. There are simply no words to describe the Wisconsin cheese ball as it was so delectable and creamy and tasty. The assorted crackers and Crostini perfectly complemented the basket. My youngest son decided to have the in-house salad this was mixed greens with slivered onion tomato and shredded carrots with a bit of Parmesan in a red wine vinaigrette. The crunch of the mixed greens was just amazingly fresh and the fresh bread basket that accompanied added texture. 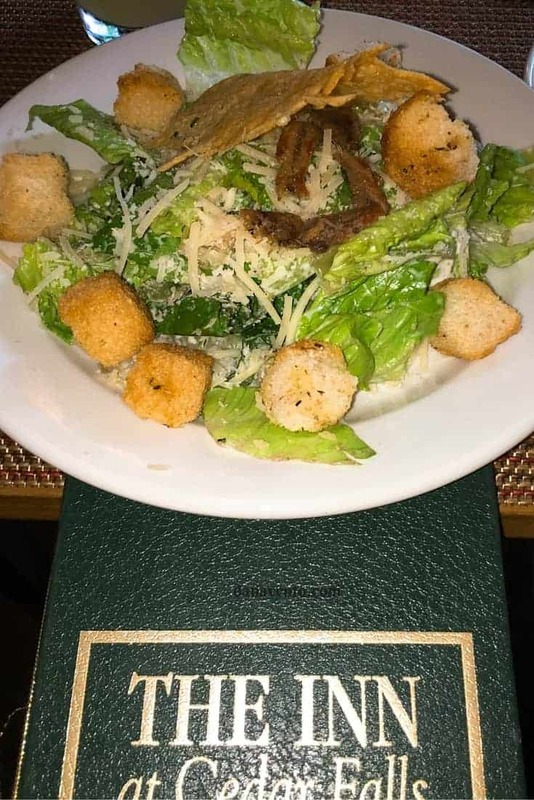 I dined on the Caesar salad pictured above) which was shredded Romaine lettuce with Parmesan croutons and grilled anchovies coupled with the Cesar dressing and a lovely Parmesan crisp. This salad is a must for anybody who loves the taste of a Caesar salad as I have had nothing that compares to this. 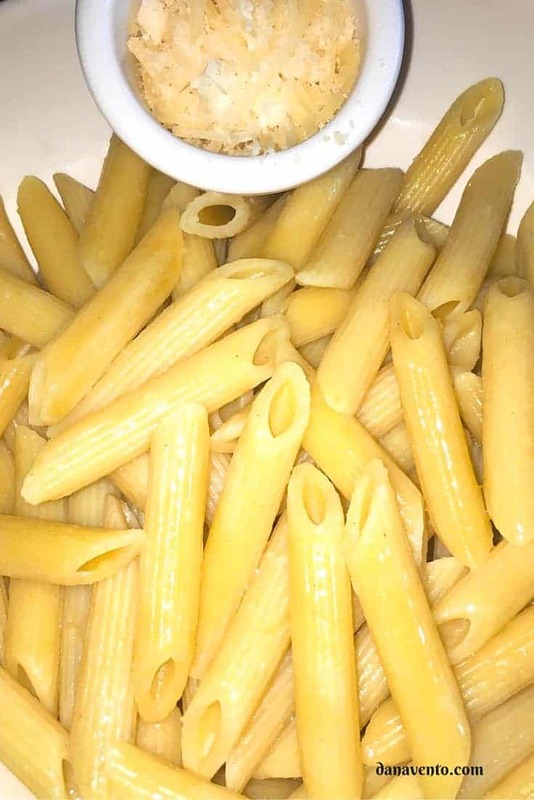 My son with food allergies had buttered Pasta with shredded Parmesan and he was quite content. Our personal thanks to Executive Chef Anthony Schulz for the phenomenal food and presentation and for keeping my son free of cross-contamination. My oldest son chose to dine on the Roasted 6 ounce Filet Mignon. 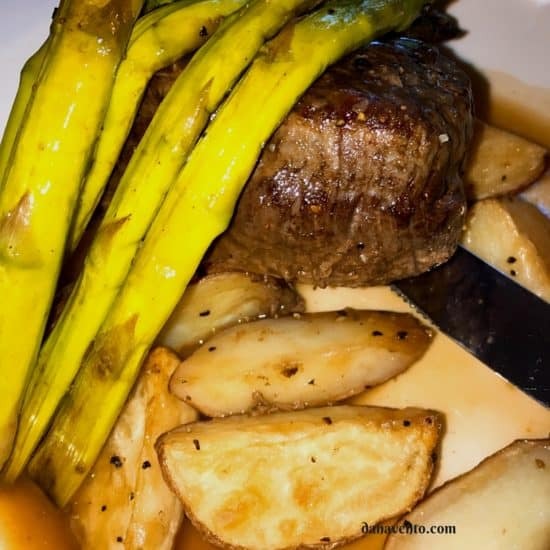 The filet offered a blueberry ale demi accompanied by roasted new potatoes and perfectly prepared asparagus. That poor meal never stood a chance once the food was set down in front of my son. My choice was the pan seared Miso Glazed Sable-fish because I have never dined on sable-fish before. This had snow peas and chilies accompanied by a purple sticky rice and a ginger lemongrass broth. This was an outstanding choice as it offered delicious vegetables and a fun rice along with a fish that was very mild tasting and lightly oily. 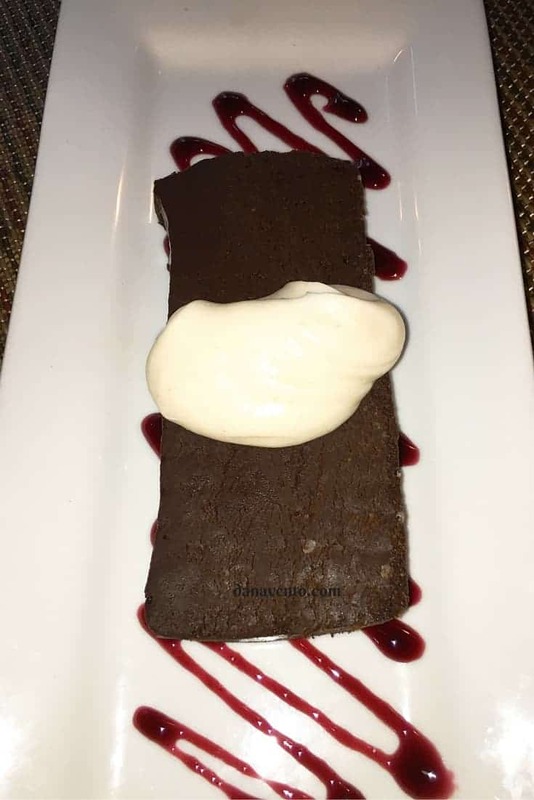 Flour-less Chocolate Torte with Sweet Cream and Raspberry Coulis. The entire Hocking Hills area is calming, lovely and totally off the grid, which allowed me to kick back, enjoy our time away and really take-in the entire ambiance, and facility. People were dining on dinner quietly together, enjoying the patio areas, hanging at a fire pit, walking the property and just allowing nature to bless them with time and beauty. It is effortless to enjoy yourself at the Inn & Spa at Cedar Falls, but you can truly indulge in a bit more than just nature. Meals that satisfy with such beautiful presentation without being overdone is what allows the unique ambiance at the Inn & Spa at Cedar Falls to perpetuate. 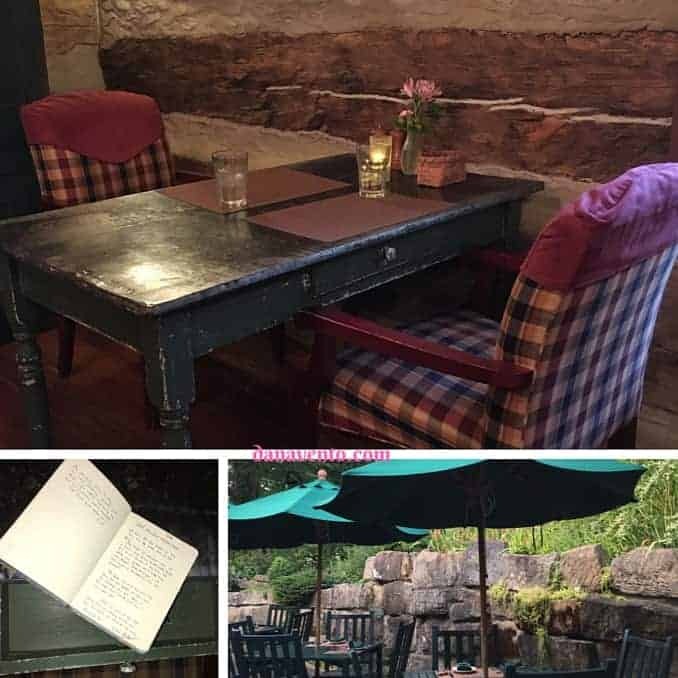 After reading a few ‘odes to the Inn & Spa at Cedar Falls’ in the handwritten notes at the table, I knew that others felt just the same. We again would like to thank Ellen Grinsfelder and her staff, Brittany, Executive Chef Anthony, Melissa, Emma and anyone we forgot (not on purpose) for a wonderfully lavish evening. Lavishly live travel out loud, and if you are in the Hocking Hills area, this destination is a must! Nice and cozy place. What a wonderful place to bring your partner. Thank you for sharing this wonderful blog. Sounds like a wonderful spa to have a wonderful time with some great experience to cherish. The meal looks delicious & healthy and I am in love with that yummy salads & dessert right away! It’s nice and cozy looking, isn’t it? I like that it has that ‘welcome home’ appeal to it. My, this place really looks so naturally comfortable to my senses. I really love that picture you took with the two chairs and the trees behind. The food suits my tastes very well! The food looks heavenly especially the flourless torte and for that reason alone inn spa at cedar falls takes my fancy. I love this! It looks like an old log cabin. That would be the type of place that I would love to spend the night. I love the rustic feel of the place, and combine it with amazing line of food makes it even more love. That was a nice spa! The foods look so yummy and the place looks so relaxing. Nothing can get prettier and more relaxing than this! I love the place that you stayed in and it’s the perfect place to go to when you need some rest and relaxation! The food looks amazing! That food looks incredible! I would love visit and get a spa treatment as well! Oh my, what a dreamy looking place. You seldom get that around here. If there is one, must be a private property. Wow, I want to have a short stay there. The food looks delicious and the place is wonderful. Oh what a lovely place for a getaway. The food looked great and it’s nice that they were able to accommodate for your son’s allergies. What a fun trip for you and your boys! I would totally eat that yummy food and would love to stay there in the future. Those meals look so yummy! I think I will try this place some day. The food looks so yummy. 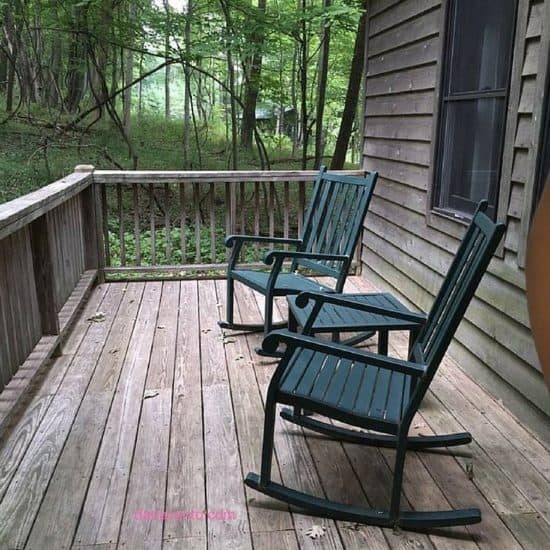 I love the chairs on the porch. That sounds lovely! All of the food there looks amazing.